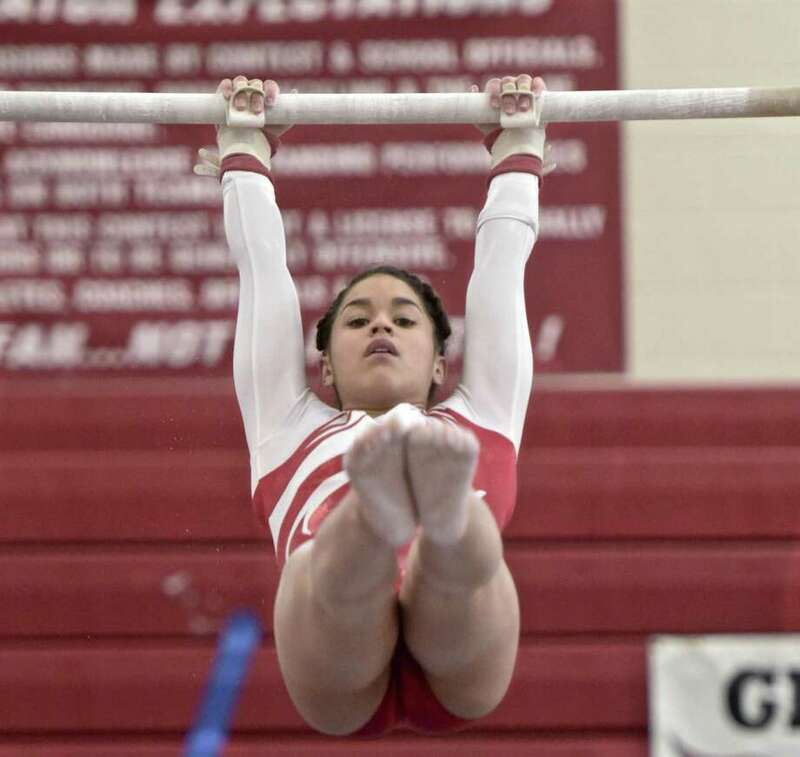 Adnerys De Jesus, Greenwich High School, competes in the uneven bars at the Connecticut State Open gymnastics meet, Saturday, March 3, 2018, at Pomperaug High School, in Southbury, Conn.
SOUTHBURY — Not even a fall off the balance beam by Greenwich High School’s best gymnast was going to derail the Cardinals’ run to the State Open gymnastics championship. The FCIAC and Class LL champs completed the postseason trifecta on Saturday at Pomperaug High School, amassing 143.525 points to run away with the program’s first State Open the championship. Greenwich was 5.075 points better than Woodstock Academy’s 138.425. Trumbull was third at 136.775 and Wilton, the Class M champ, took fourth with 132.075. The Cardinals’ large margin of victory meant it was easy to overcome a fall on beam by top gymnast Adnerys DeJesus. The Cardinals did just that as Greenwich junior Kelsey Fedorko took first in the event with a score of 9.6 to edge DeJesus’ 9.550. Ellie Marino added a 9.0, giving the Cardinals three scores of 9.0 or higher. Greenwich only used four girls in the meet, each competing in the All-Around, as well. DeJesus went on to win the Open all-around championship with 37.675 points. Fedorko placed second in 36.225. Marino was seventh (35.6) and Cardini was 17th (34.025). DeJesus also won individual titles in the vault (9.575) and uneven bars (9.575). Marino took third in the beam (9.025) while DeJesus, who would have won the event had she not fallen, placed fifth (8.975) and Fedorko (8.975) was sixth. FCIAC teams had five of the top six scores in the state this season, with three of the top four getting to compete for the State Open title. Trumbull got off to a slow start, but rebounded well, coach Celina Huber said. Wilton’s Jessica Olin led the Warrior charge, placing in three of four individual events plus the All-Around. She was third in the floor (9.4) and sixth in the vault (9.1) and bars (8.7). The storied career of Foran’s Brianna Laggis had a tough ending. The senior — who has overcome a broken bone in her back and a torn ACL in her career to return to the mats this season — gutted her way to a third place finish in the All-Around. She was fourth in the beam (9.0) and floor (9.4), and fifth in the bars (8.925), before finishing the day in the vault. After her first practice vault, in which she rotated short, Laggis came up lame on her injured knee. She tried one more run-through, but didn’t complete the vault. When warm-ups were completed Laggis tried one vault and scored an 8.850 on it, but was in physical pain. Foran coach Dina Sklanka quickly shut her down, forcing her to miss her second vault and a chance to improve her score. Newtown’s Emma Delia won the State Open balance beam championship with a 9.450. She was eight in the all-around. Sara Rodia of Shelton, meanwhile, was second in the vault (9.3) just in front of Mercy’s Mia Lawrence (9.225). Daniel Hand’s Erin Naclerio was sixth in the All-Around (35.7). VAULT—1. Adnerys De Jesus (Greenwich) 9.575; 2. Sara Rodia (Shelton) 9.30; 3. Mia Lawrence (Mercy) 9.225; 4. Samantha Markland (Trumbull) 9.2; 5. Mikayla Dumas (New Milford) 9.2; 6. Jessica Olin (Wilton) 9.1. ALL-AROUND: 1. Adnerys De Jesus (Greenwich) 37.675; 2. Kelsey Fedorko (Greenwich) 36.225; 3. Brianna Laggis (Foran) 36.175; 4. Jessica Olin (Wilton) 36.075; 5. Samantha Markland (Trumbull) 35.875; 6. Erin Naclerio (Daniel Hand) 35.700.